The start to the New Year for me has been a busy one. I have got a very exciting time ahead of me as I am starting a brand new job in the fashion industry very soon! It is an amazing opportunity and I hope to share it here on my blog when the time is right and I am settled in! So the last couple of weeks, I have been super busy preparing and of course celebrating with my friends and family. 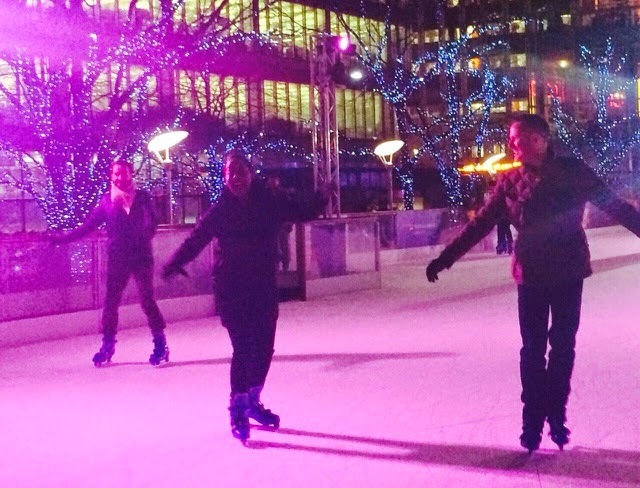 I never had a chance to visit Winter Wonderland or do any of the Christmas markets over the festive period and I really wanted to try and go Ice-Skating, so I was very pleased to discover that there was still an Ice Rink open in London at the heart of the City in Canary Wharf (above). I am not very graceful on the ice!! I haven't gone skating in a LONG TIME and was worried that I had forgotten how to skate! 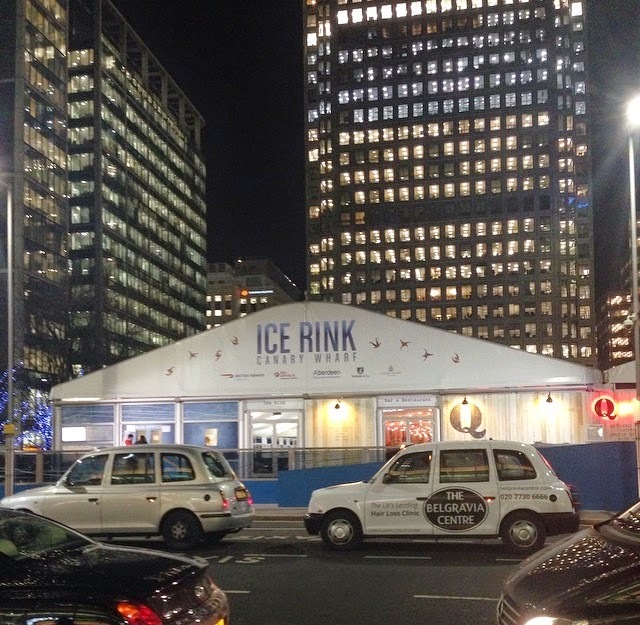 The rink at Canary Wharf is set in a beautiful location. Surrounded by all the city skyscrapers, the rink is almost like it is in the middle of a metropolis. Unlike other venues, this rink also has a skate path which is overhung by lovely fairy light trees - as I was there in the evening it felt like magical Narnia with all the lights and sparkle as I skated through it. For those who are more like Bambi on Ice then Torvill and Dean (!) 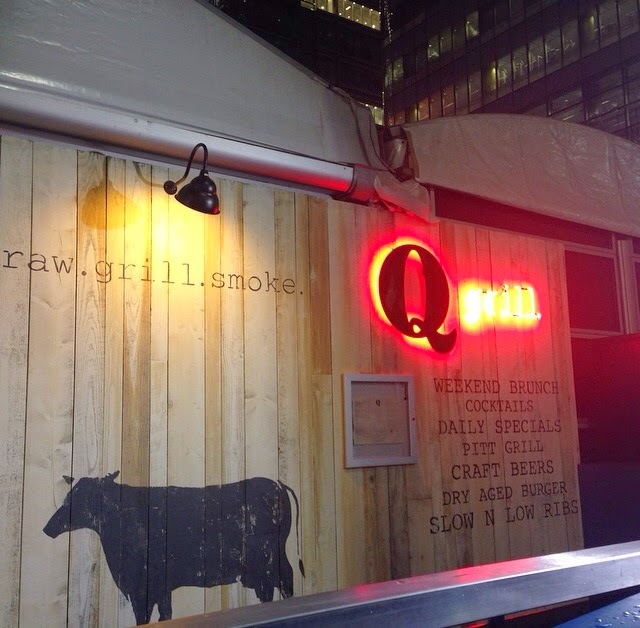 there is a an onsite bar and restaurant called Q Grill which has an outside terrace where you can watch all the activity from. The inside of the bar is really quite chic (exactly what you would expect from a location in the heart of the City) and is a great place to meet for drinks and nibbles before going on the ice. Its a great venue - surrounded by bars and restaurants (we ate at Wahaca afterwards), I would definitely go there again. It's open until the 28th February. I haven't gone ice skating in a long time either and I'm kind of nervous to start again. I was really nervous at the start too Shali! But after a while I quickly got used to it and felt confident enough to move away from holding on to the sides!! You should go-it's a great cardio workout!! !